1. 3rd Class Cabin berth. 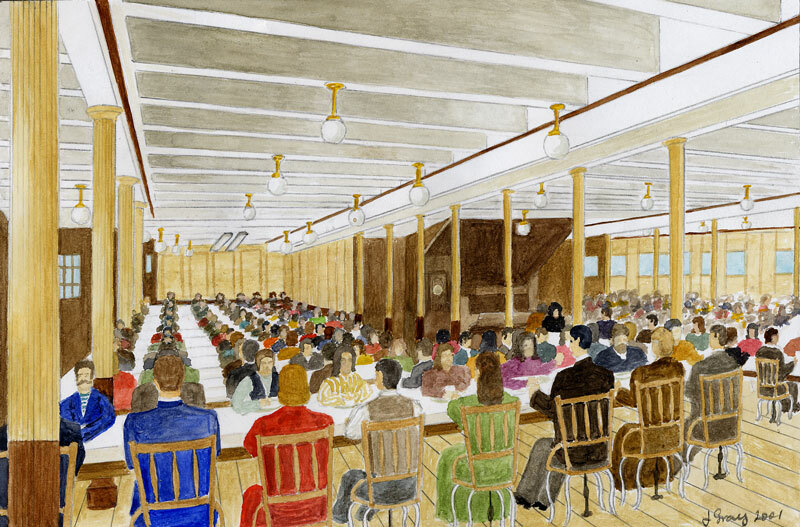 A typical 3rd Class cabin aboard the Lusitania. Though basic,these cabins were at least electrically lit and heated, which was a considerable improvement upon previous liners! The bed linen featured prominently woven Cunard logos, to deter theft! 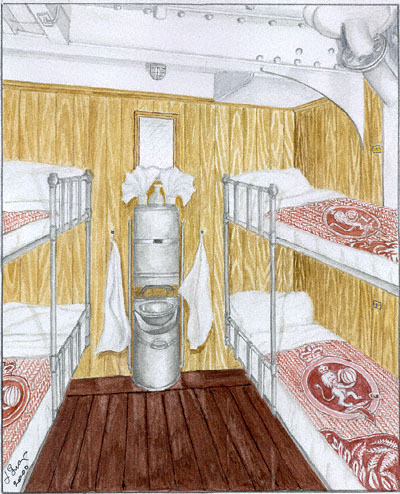 The illustration shows a four-berth cabin. 2. 3rd Class Dining Saloon The 3rd Class Dining Saloon was fitted out in dormitory style and featured a piano at the far end for passenger use. Quite a contrast to the First Class Dining Saloon! 3. Lusitania’s Bridge The Bridge of the Lusitania, viewed from the Port side. Fully enclosed, it also featured an enclosed, separately heated wheelhouse (on the right of the picture). The Lusitania's Bridge had an altogether more "Naval" feel to it,due to the ship's envisaged naval role as an armed merchant cruiser. 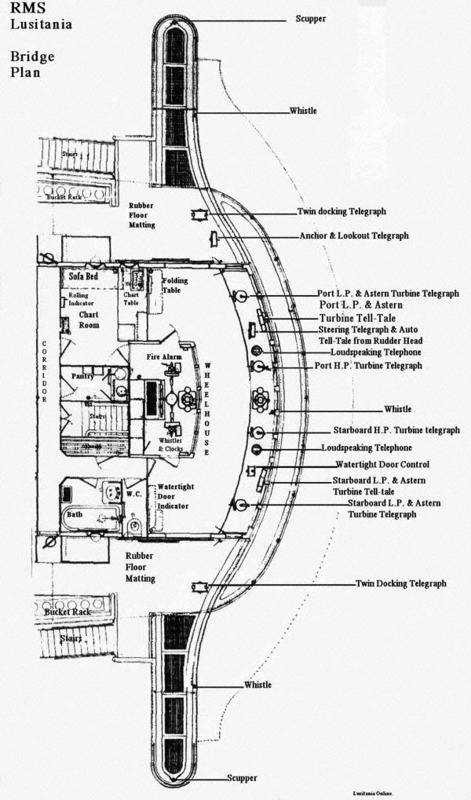 A detailed plan of the Bridge can be found below. Click for larger view 4. Port Side Regal Suite The Regal Suites were the exclusive preserve of the wealthiest passengers. 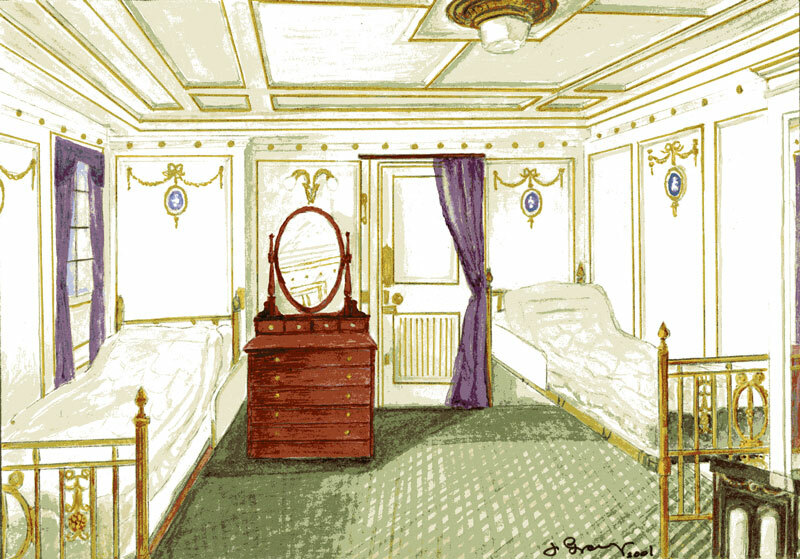 There were two regal suites, one on each side of the ship, located forward on the Promenade Deck. Pictured above is the main bedroom of the Port Side Suite, which was based on the Petit Trianon in the Palace of Versailles. 5. 1st Class Library The First Class Library and writing room was fitted out in the 18th Century style of the Adams brothers. 6. 1st Class Lounge A masterpiece of James Millar's architechture. The huge barrel-vaulted skylight contained 12 stained glass windows by Oscar Patterson, each depicting a month of the year. 7. 1st Class Dining Saloon and 1914 Menu The First Class Dining Saloon. This was undoubtedly the crowning glory of James Millar's architecture aboard the Lusitania. 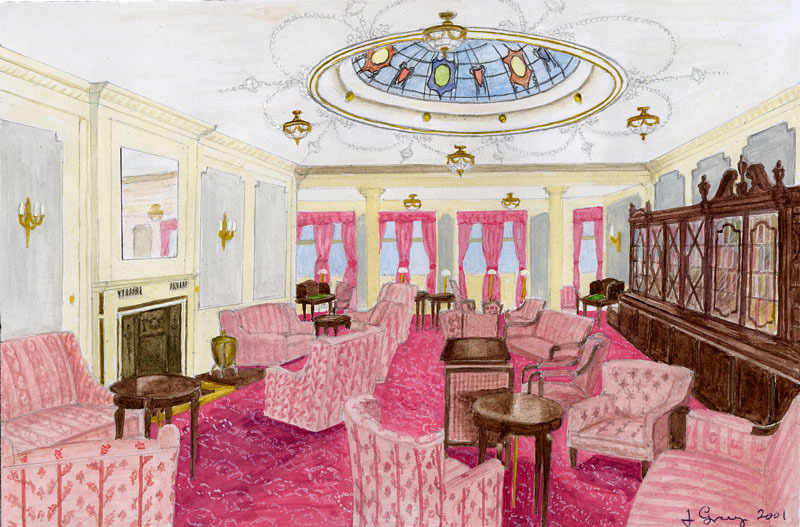 The Saloon occupied two decks and was capped by a huge plaster dome. 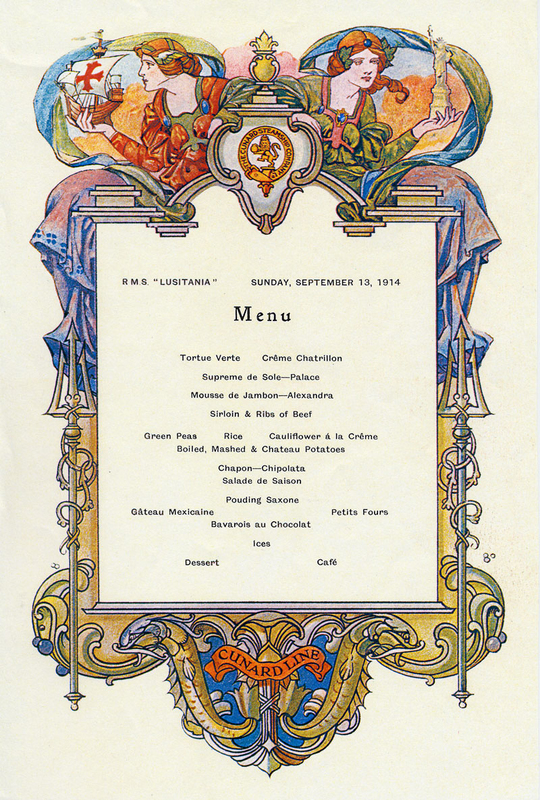 Six weeks after the outbreak of the Great War, the Saloon Class Menu was still as rich and lavish as ever! The Story of John “Jack” Spence John “Jack” Spence served on the Lusitania as a waiter. We are grateful to Earl Deamond, who contacted us from across the pond with Jack’s story. Jack was a friend of Earl’s family and Earl very kindly copied every page of Jack’s Service Record and Discharge Book for us but sadly, spacial constraints do not permit us to reproduce them all on the website. What follows was written for us by Earl. Born on August 10, 1885 in Edinburgh, Scotland, Jack enlisted with the Liverpool Scottish Infantry Battalion ca. 1904 and was discharged ca. 1906. Early in 1908 Jack began his service as a seaman for the Cunard Steamship Company Ltd and on March 6, 1908, as a Waiter, he made his first trans-Atlantic voyage on the RMS Lusitania. During the next several years he was at sea aboard the RMS Lusitania for many festive occasions such as the Coronation Day of H.M. King George V and H.M. Queen Mary and several New Year’s Eve parties. On July 26th, 1912, Jack was promoted to a 1st Class Waiter and on September 21st, 1912 Jack transferred from the RMS Lusitania to her Cunard running mate the RMS Mauretania which held the Blue Riband from 1909 to 1929 as the passenger liner crossing the Atlantic Ocean in regular service with the record highest speed. On March 11th, 1913 after 72 trans- Atlantic voyages from Liverpool to New York and back, Jack finally ended his employment with Cunard. Following World War I, Jack and his mother Elizabeth Lorimer (nee Rutherford) Spence, emmigrated to Canada and they resided within the City of Toronto. By the late 1920’s, Jack was employed by a Canadian communications company, the Maclean-Hunter Publishing Company Limited, which created popular publications such as the general interest magazine Maclean's, the business newspaper Financial Post and the women's magazine Chatelaine. Jack remained with Maclean-Hunter for over 30 years until his retirement in 1952. Subsequently, in 1953 Jack and his mother purchased a home in the Borough of East York, Toronto and the following year his mother passed away at the age of 91. During Jack’s retirement he remained at the same house until his passing in 1974 at the age of 89. Jack Spence: Portrait taken whilst he was serving with Cunard. Photo supplied by Dennis Reeves, Liverpool ScottishTrust Museum. The Second Class aboard the Lusitania rivalled First Class on any other ship. However, the heavy ornate arches and support pillars were in fact covering great steel webs and joists, installed by the buildersat the last minute to help dampen the ship's vibration problems. Unfortunately, these brackets and stiffeners wrought havoc with James Millar's planned decor! Welcome aboard the Cunard steamer RMS Lusitania. 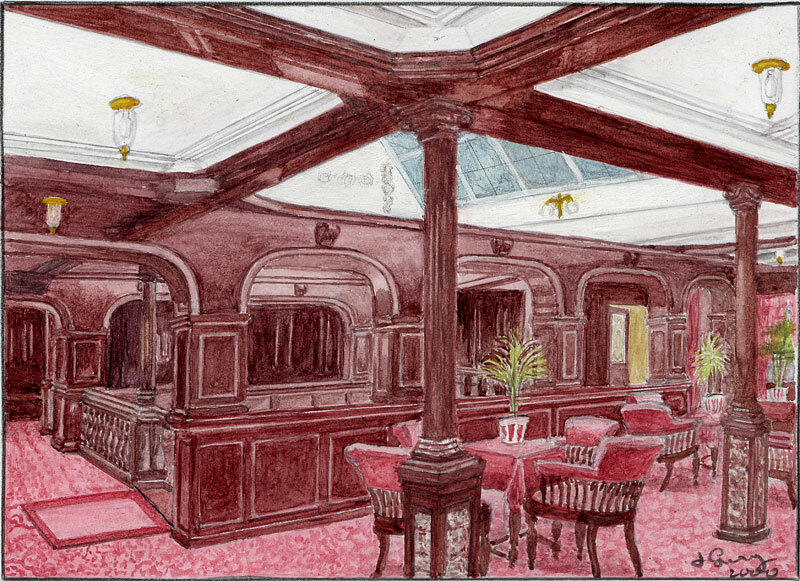 Obtain a glimpse of some of the fabulous interiors of the lost liner, painstakingly recreated below by Lusitania Online's resident artist, John Gray. Welcome aboard the Cunard steamer RMS Lusitania. You can take something of a guided tour of the ship. 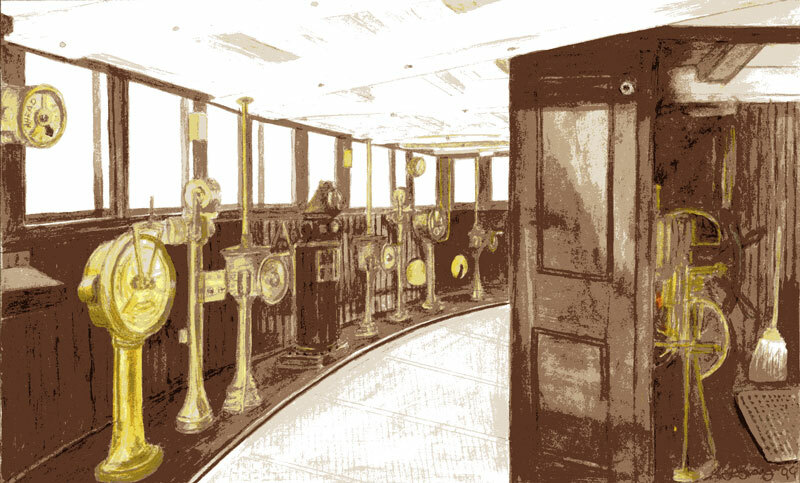 Simply click on an numbered item below the ship to obtain a glimpse of some of the fabulous interiors of the lost liner, painstakingly recreated by Lusitania Online's resident artist, John Gray. 1. 3rd Class Cabin berth. 2. 3rd Class Dining saloon. 3. Bridge. 4. Port Side Regal Suite. 5. 1st Class Library. 6. 1st Class Lounge. 7. 1st Class Dining Saloon and 1914 Menu. 8. 2nd Class Lounge.